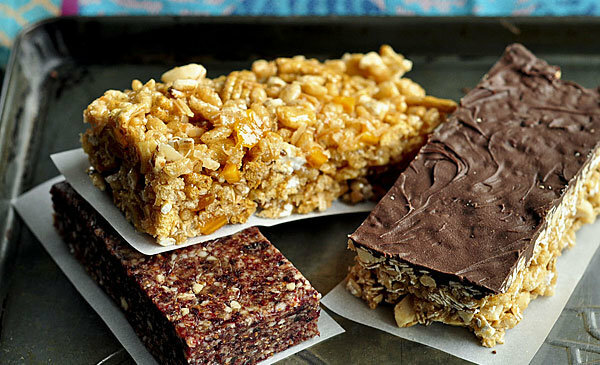 Why make your own energy bars? First, you’ll trim a few dollars off your monthly food bill. Second, your homemade bars will be far better workout fuel than commercial bars made with preservatives and artificial sweeteners. Besides, making these snack bars is a snap. Brown rice syrup is your best friend for both chewy and crunchy bars. Once difficult to find, you can now buy jars of it in the natural foods sections of many grocery stores. This thick syrup has a sweet, caramel-like flavor and it helps to bind the ingredients in your bars. A little rice syrup will make the bars crunchy, and more makes them chewier. Even easier than using rice syrup, you can make raw energy bars with dates. These semi-dry fruits become a sticky paste when ground, and the paste works like glue with other dried fruits and nuts. Dates also taste like brown sugar, sweetening your bars without the addition of refined sugars. Once you get a feel for how these bars are made, you can start experimenting with your own combinations of fruits, nuts, and grains. You won’t find energy bars as good as these at the store. Note: Double the rice syrup in this recipe if you’d prefer chewy bars. Makes 8 large or 16 small bars. Heat the oven to 325 F. Line an 8- by 8-inch baking pan with parchment so the ends hang over the sides of the pan. A little cooking spray helps hold the parchment in place. Combine the peanuts and rolled oats on a baking sheet. Toast until the nuts are fragrant, 8-10 minutes. Combine the nuts, oats and cereal in a large mixing bowl. Combine the rice syrup, peanut butter, brown sugar, vanilla and salt in a small saucepan. Cook over medium heat, stirring occasionally, until the syrup loosens to a pourable consistency and bubbles appear on the surface, 4-5 minutes. Pour the syrup over the nuts and cereal. Stir with a heat-proof spoon until the dry ingredients are evenly coated. Scrape the mixture into the pan and pat it firmly into the corners. Bake for 5 minutes. Sprinkle the chocolate chips over the bars and bake for another 2 minutes. Spread the softened chocolate evenly over the top of the bars. Cool overnight. Refrigerate as necessary in warm weather to set the chocolate. Remove the bars from the pan by lifting on the parchment. Cut into bars. Wrap each bar in wax paper or plastic. Store at room temperature for up to a week. Note: Halve the rice syrup in this recipe if you’d prefer crunchy bars. Combine the coconut flakes and cereal mix on a baking sheet. Toast until the coconut turns golden, 8-10 minutes. Combine the coconut, cereals and dried fruit in a large mixing bowl. Combine the rice syrup, brown sugar, vanilla and salt in a small saucepan. Cook over medium heat, stirring occasionally, until the syrup loosens to a pourable consistency and bubbles appear on the surface, 4-5 minutes. Pour the syrup over the nuts and cereal. Stir with a heatproof spoon until the dry ingredients are evenly coated. Scrape the mixture into the pan and pat it firmly into the corners. Bake for 5 minutes. Cool overnight. Remove the bars from the pan by lifting on the parchment. Cut into bars. Wrap each in wax paper or plastic. Store at room temperature for up to a week. Combine all the ingredients in a food processor. Pulse several times to combine the ingredients. Break up the dates if they have clumped together, then run continuously until a ball begins to form. Emma Christensen is a writer for TheKitchn.com, a nationally known blog for people who love food and home cooking. Submit any comments or questions to kitchn@apartmenttherapy.com.